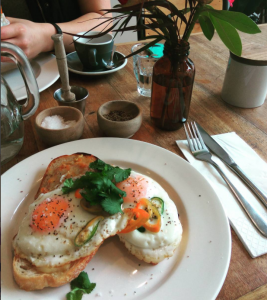 I was in a fancy café awhile back, eating a very fancily arranged egg on toast. Here’s my attempt to portrait my dining experience in Instagram style. And I thought to myself, “If we never learnt how to cook, this indulgent experience would never have existed in the first place!” And the thought itself terrified me. But, why did we started to cook our food anyway? We are the only animal that cooks our food. Cooking allowed us to become human, in both biological and evolutionary sense. Primatologist, Richard Wrangham famously championed this idea. He said, above all else, “Cooking is what made us human”. 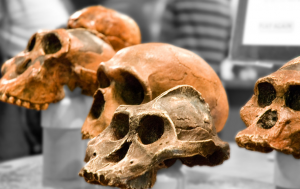 His theory suggested that humanity was created by the Homo erectus learning to cook 1.8 million years ago. Cooking gave us the edge in evolution because it leads to smaller teeth, reduced gut size and most importantly, bigger brain. Cooked food fed our growing brains and created a lot of free time. The success of human culture and evolution is because of our remarkably advance brain. It consumes 1/5 of our calories intake. In fact, human has an enormous brain for our body size when compared to other primates, like the Chimpanzee, who spends more than half of their day eating. We don’t need to constantly chew plants for energy because we found another way to gain more energy out of food. Part of that is thanks to hunting and eating large animals, but also to tools that allowed us to cut meat from large animal carcasses and break bones to get at their calorie-rich marrow. After cooking, food becomes more digestible and less prone to poisoning. Our ancestors didn’t just eat meat alone. In fact, raw plants were still the predominant food source, but some of these vegetables were cooked. When cooking plants, the heat breaks down their tough cell walls, which lets them release most of their nutrients. Cooking also makes them easier to chew and even sometimes deactivates toxin in plants. Not only that, heat denature or unwinds proteins, which allows our bodies to digest them more comfortably. Paleontologists proposed that our ancestor got access to more food, and more energy by cooking previous inedible plants. Cooking have the same protein-breaking effect on meat and meat products too; you can see this when you cook an egg, it goes from clear to white. When you put a steak on the grill, the fat on the meat starts melting out. 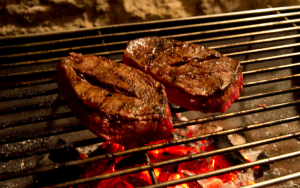 The heat from the fire causes the steak to lose some calories, but it also makes that piece of meat easier to chew. If you were to eat that steak raw, you had to use up to about a quarter of the energy from that steak to digest it. Cooking is more than just putting the meat over a fire. Cooking could also mean crushing food into a more edible form or preserving food by breaking it down with salt. It could also mean cutting it into pieces and drying it in the sun. In fact, cooking had become complex. It intertwines with our cultures, out history and even our sense of belonging. We ate our way to become a stronger species. But, it is not how much we ate; it is how we transform the food we can eat. As the hours spent on getting enough calories lessen, we have more time to do things like developing languages, invent tool and write blogs in hipsters’ cafe. And I am here to celebrate that, with a video of me cooking. Great post. Cooking does seem like a massive advance involved in our evolution. I can’t believe that eating a raw steak would require a quarter of its energy to digest!